Sharing money-saving ideas to brighten your days and bring joy into your life. 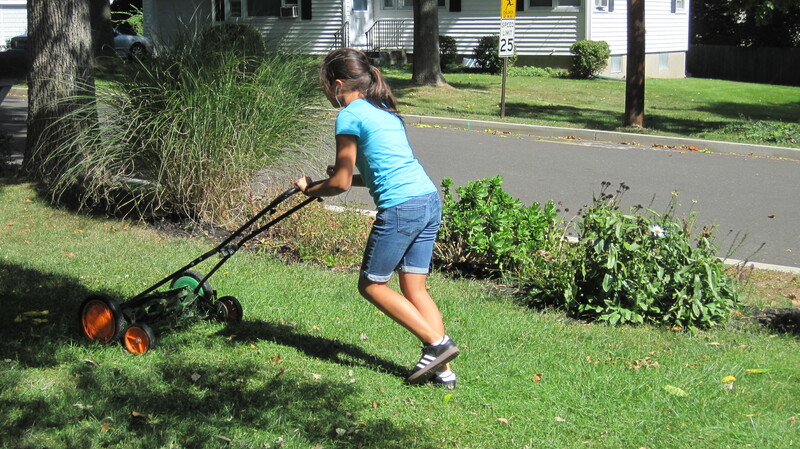 Another Reason to Invest in a Reel Push Mower: It’s Easier to Get Your Kid to Mow the Lawn! First push mower lesson for our daughter. Last spring, I wrote about the benefits of having a reel push mower. With the price of gas going up again, being diligent about using this mower has been good for our wallet. However, if the grass gets too long, the reel push mower is more difficult to use. We have a gas-powered mower, for those string of rainy days when the grass grows twice as fast. 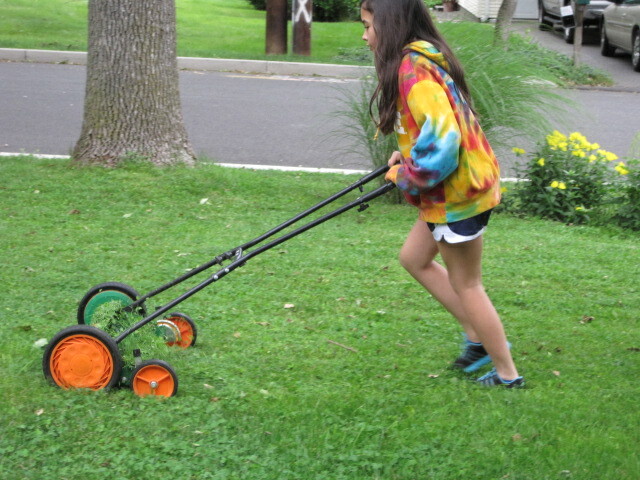 Over the summer, my husband began teaching our daughter to mow the lawn using the push reel mower. She started out just mowing the front yard. Our daughter mowed the front and backyard last week! Yay! And she didn’t ask/demand to get paid. Yay! Last week, she mowed the front and backyard for the first time. 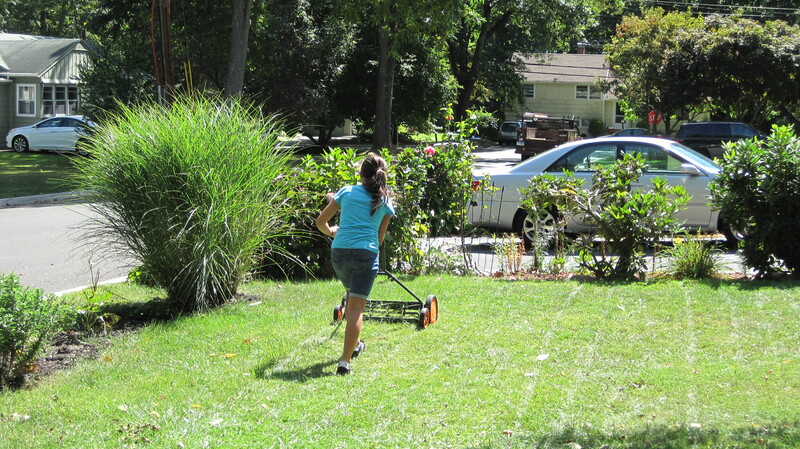 And, here’s the bonus: without being asked, she mowed the backyard, which is twice as big. Our daughter, plugged in to her iPod Nano, while she mows the lawn. Hey, whatever works to give me and my hubby a break from this chore! The secret may have been her plugging herself into her iPod Nano. Smart girl! I enjoy listening to podcasts when I mow with the push reel. Hey, whatever works to make a chore easier to do, I am all for it! easier to teach your child to mow the lawn. Eventually, you can hire her/him out to do the neighbor’s lawn. Yay! Thanks for the referral. Keep on pushin’! 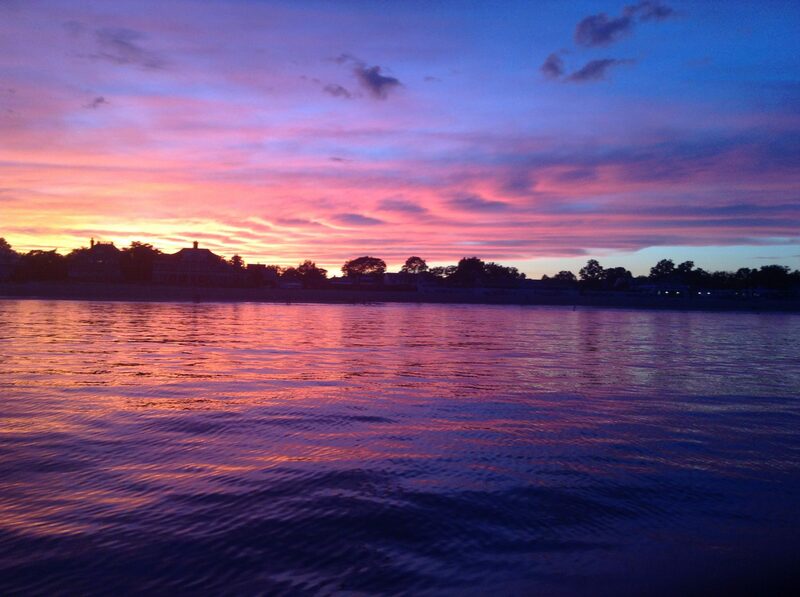 Feel calm about your finances again. Click above, sign up, download your free PDF! Tap into the world of free books, films, seminars and more! Click the box above to receive your free gifts! © 2008–2016 Two Frugal Fairfielders. All rights reserved. No content on this site may be reused in any way without written permission.